In a recent survey of 156 landowners conducted by Washington State University Extension, 69% of landowners responded they were not interested or only somewhat interested in growing bioenergy crops at this time citing possible production inefficiencies, environmental, and weather concerns. 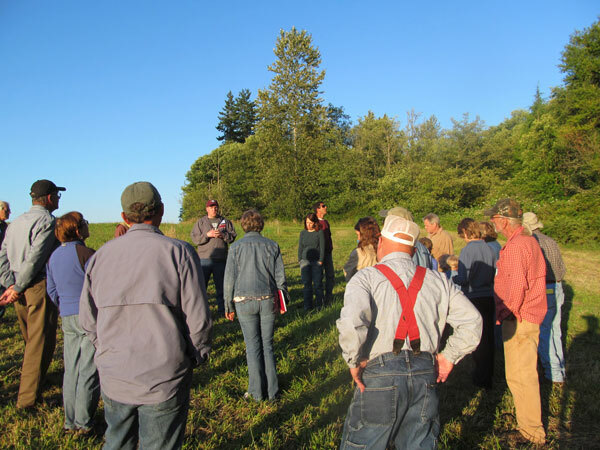 Washington state landowners learn about poplar bioenergy crops near Stanwood, WA. The AHB Extension Team at Washington State University conducted a survey of farm landowners in Washington state in 2014 and 2015. The purpose was to assess farm landowner’s familiarity with, and interest in, bioenergy crops in general and their familiarity specifically with hybrid poplar trees grown as a feedstock for biofuel and biochemical production. Survey respondents shared that financial considerations are a key factor in their decision on whether or not to grow bioenergy crops. Considering that biomass markets for biofuel and bioproduct feedstocks are currently extremely limited in Washington state, farm landowner reluctance to adopt poplar as a new crop is not surprising. Landowners also expressed their reluctance to plant poplar based on the difficulty of converting the poplar fields back to another crop. Fifty-five percent of the survey respondents felt that it would be a major challenge to do so, citing concerns over removing the woody debris left in the field. Past conversations with landowners revealed that this perception is based on legacy poplar stands planted in the late 1980s and early 1990s for pulp and roundwood production. Once these poplars were ready for harvest, the intended product markets in the region had significantly diminished, making the poplar trees difficult to sell and the stumps left in the field difficult to remove. Grown as a short-rotation woody crop, poplars for bioenergy would be harvested every two to three years. The resulting rootstock would be relatively small and easily removed with conventional farming equipment. Informing farm landowners of the differences between long- and short-rotation poplar cultivation will be a key task for Extension professionals working with growers considering poplar as a viable crop. The AHB Extension Team is tasked with addressing farm landowner’s perceptions, needs and concerns for growing poplar for bioenergy. The results of this survey will help guide outreach objectives in the future to ensure that farm landowner concerns about bioenergy crops are addressed as bio-industries in the Pacific Northwest become established.